Turkish saying Pamukkale, ancient name Hierapolis, is located about 20 kms north of Denizli not only invites millions of visitors each year to see a nice visual feast with waterfalls and travertines, but also to walk among the sarcophaguses and nice remains of ancient Roman city. The plateau, situated on the southern slopes of mount Çökelez made from source of hot water with calcium oxide , has an impressive picture today. It is believed that the thermal water containing with calcium salts and carbon dioxide gas at a temperature of 35 celcius ddgeree has been one of the most important destinations as to be healing centre for recovering some various diseases and sicknesses for centuries. Today the city’s goal is to become a spa center in Turkey in a short time as it was in the past. During the Roman era it had a great fame among the top soceity of Roman aristocrats called as Hierapolis- hot water spa centre. 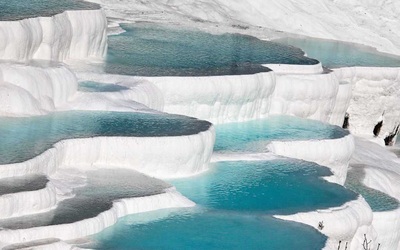 Natural terraces fed by hot mineral water, the pools in front of the travertines in one hand , the charming ancient Roman collonnaded streets, stores, temples, thermal baths on the other hand have made a great impact for healers and visitors to come and spend some time here. 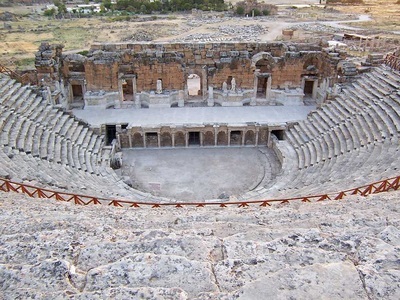 The ten thousands seated capacity of Hierapolis theatre has also offered to entertain spectators with Greek tragedies, celebrations, concerts , speeches and public events. 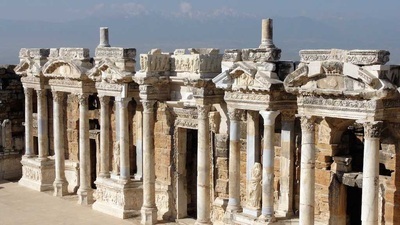 That is why Hiearapolis has been noted for a famous vacation centre in Asia Minor after Ephesus with the population about 100.000 in Roman period. Hierapolis- Holy city in Greek, hot Spa centre in Roman- was founded as an Hellenistic town by Eumenes II under the rule of Pergamene Kingdom in 190 BC. Hiearapolis was destroyed by the erathquakes in the 1st C AD several times but the city was rebuilt and had a golden age between 1st and 2nd centuries AD during the Pax Romana-Roman peace. Theatre, baths, agoras, temples, sanctuaries and so many beautiful edifices were built in Roman times. 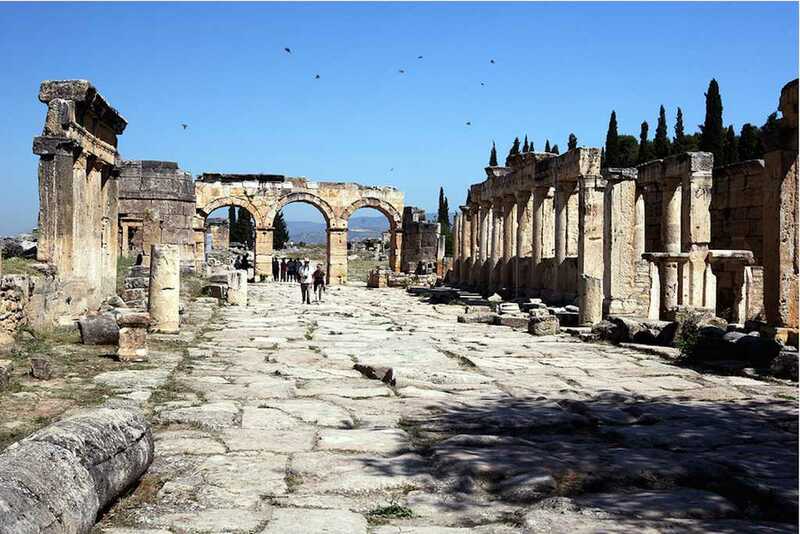 One of the deciples of Jesus, St. Philip was nailed upside down on the gate of Hierapolis made this city as a religious significance for early believers. It became a Byztantine city in 395 AD when Rome was split into two till the end of 11th AD then Turks took over the area and Turkish era began. 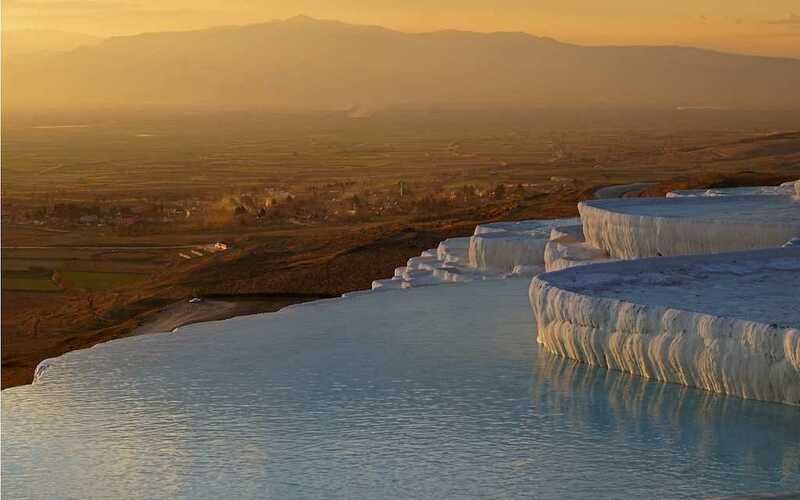 During the Ottoman time Hierapolis was called as Pamukkale-means Cotton Castle- and used as a thermal centre especially with hot water and its mud. The baths also were used by the travellers and caravans masters as well as the cavans built on the trade roads. 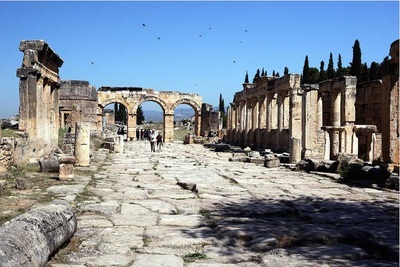 Due to architectural features, the city gate which is thought to be accompanied by a monumental gate in 14m.wide and about a km long, was the ceremonial road of Hierapolis in which St Philip was nailed upside down on. There had been a drainage system under the main road taking the dirty water away from the downtown. There were the stores, warehouses and shops on both sides of the road. Unfortunately the main road was spoiled out by shortened in 8m. wide in 6th because of the earthquakes and occupations by different nations. The surface of the road was covered with limestone layer. The area behind the Fronties road was reserved as agora-shopping mall –after the big earhqauke happened in 60 AD and stores were built here. Before the erathqauke, the area used to be cemetery-necropolis-of the city. In 2nd C AD this agora became one of the biggest shopping malls of Asia Minor in 170m wide and 500 m long. The excavations in Agora began in 1979 and still goes on digging out by Italian archeologists and so many findings from here are also on display in the museum. Trithon Fountain House along with the Temple of Apollo is one of two major monumental buildings of Hierapolis. The building is open to the street from a pool of 70 meters in length and niches dug into them where a statue formed with two folds on. Amazzonamachi blocks and the personification of the river reliefs are really nice. The latin written inscription of emperor Septimus Severus tells us that the fountain house was built in the half of 3rd C AD. Apollo was the main diety of Hierapolis so the sanctuary was dedicated to him, healing God and sun God. The sanctuary which is on the terrace is bound by a marble staircase. The terrace below is surrounded by marble colonnades in Doric order. 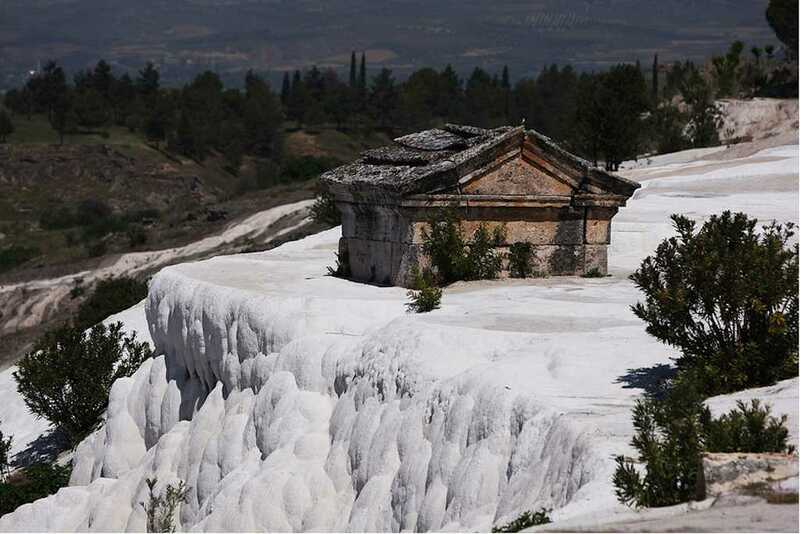 This sanctuary has been used for predictions for centuries so it has also become the income source of Hierapolis. Pagan pilgrims from Roman world used to come here to get advice. Altough it was built in 1st century AD, it had a lot of alterations till the final shape was made in 3rd C AD. Ancient Hierapolis Amphi-theatre is 1800 years old and it took about 150 years to be completed. The amphi-theatre is considered as one of the unique ones from antiquity with its mythological reliefs, magnificent scenery stage building and spectators’ seats. The capacity of the theatre is about 10.000 so we can understand that Hierapolis was about 100.000 in population in Roman times. One of the best theatres in Asia Minor situated on a hillside which can be preserved in better conditions has 50 rows of seats dividing by a diasoma. There is a vaulted passageway to Vomiterium from Diosoma. There are the columns adorned with with statues and marble reliefs on the walls behind the scene. Apollo and Artemis' s births, Dionysus, Satyr and Geometric period consisting of those fun, Marsyas and Apollo elapsed between the music competition, the wars between the gods and giants reliefs and an architrave above the door of the king of Emperor Septimus Severus' depicts the coronation ceremony can be seen today as mythohological sceneries in the amphi-theatre of Hierapolis. The Plutonium is located on the right hand side of Apollo temple. The temple was adjusted at the front entrance of travertines on marble niches with sea shells motifs.There is a login to the top pointing to the sanctuary was a holy place. The sound of groundwater resources can be heard at the entrance of Plutonium. It is closed for the visitors because of the danger caused by the toxic gas used to coming out.